A Symphony in Watercolour begins tomorrow! 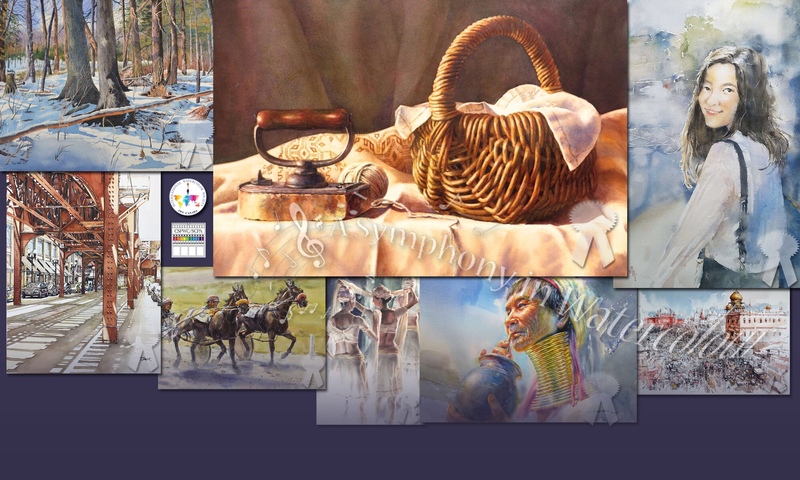 Tomorrow, watercolour artists from all over the globe will gather in Richmond Hill, Ontario, just north of Toronto, to celebrate the opening of ‘A Symphony in Watercolour’. All art enthusiasts are invited to attend the opening event at 12 noon on Friday, September 28, at Boynton House and Richmond Green. After a formal ribbon cutting ceremony, there will be part of the exhibition to view, master watercolour artists in attendance, and representatives from Winsor & Newton, QoR Watercolours, Daniel Smith, DeSerres Art Store, Da Vinci paints and RockWell Art Supplies demonstrating products. Throughout the afternoon there will be opportunities for plein air painting. The official opening and awards ceremony will be at 3 pm. Later, at 6 pm, tea and scones will be available at Burr House, another heritage building which will serve as the remainder of the exhibit space. 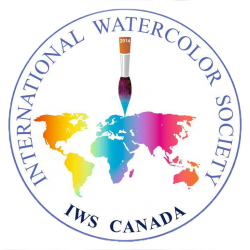 The exhibition, jointly presented by the International Watercolour Society of Canada (IWS Canada) and the Canadian Society of Painters in Water Colour/La Société Canadienne De Peintres En Aquarelle (CSPWC/SCPA), will feature the work of 95 watercolour artists from Canada and around the world. From a total of 320 entries from 32 countries who entered the competition earlier this year, 80 finalists were juried into “A Symphony in Watercolour” by Anne McCartney CSPWC, Peter Marsh CSPWC, and Rainbow Ze (youth juror). The other 15 artists are winners from last year’s IWS Canada online exhibition and attending jurors, as well as presidents and vice-presidents of the presenting societies. The five day festival opening the exhibit will continue the next day with a presentation merging painting, video and photography by renowned artist David McEown, winner of IWS Canada’s 2017 online competition ‘150 Ways to Celebrate’, a Canada 150 event. This presentation will take place at Richmond Hill Central Library as part of the Canada-wide Culture Days event. In addition, “Experiment with Watercolour” activities will be set up so the public can try it out. Other activities for the five day festival include field trips to various places in the area for plein air painting, photography, and general tourist enjoyment, such as the Oak Ridges Moraine, Black Creek Pioneer Village, the David Dunlap Observatory, Toronto Island, and the CN Tower 360 restaurant. Some of these activities are free, others will have costs associated with them. Of special note is a field trip to the McMichael Canadian Art Collection, which the gallery is providing to the IWS Canada and CSPWC/SCPA group as a sponsored event for this festival. Further information for all of these activities is available at IWSCanada.ca. 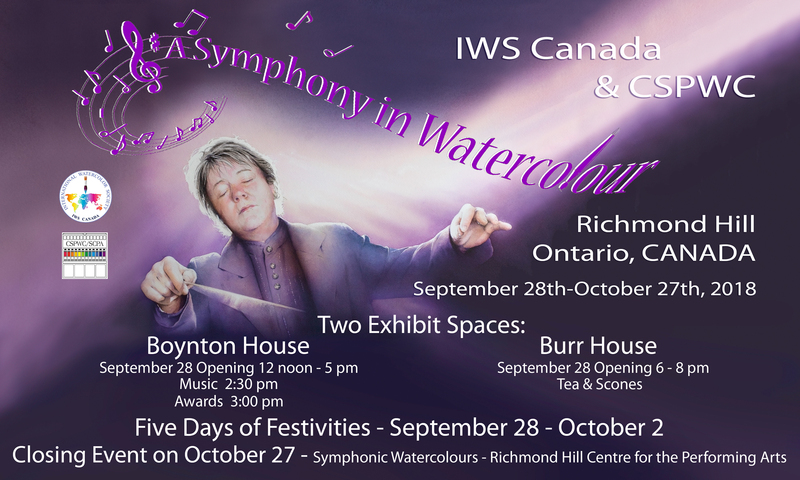 A very special part of this exhibition will be a live performance by the Richmond Hill Philharmonic Orchestra, called ‘Symphonic Watercolours’, which will take place to close the exhibit, on October 27, 2018, at 8 p.m. A slide show of the beautiful watercolour art in the exhibit will accompany music specially selected to enhance its viewing. In addition, live interpretive painting will be performed by Andrew Sookrah and Bonnie Steinberg. The theatre will also display a selection of actual paintings from the exhibit. It will truly be ‘A Symphony in Watercolour’. Why: To celebrate the medium of watercolour, and how diverse cultures can be brought together through their enthusiasm for common interests, while appreciating their differences. 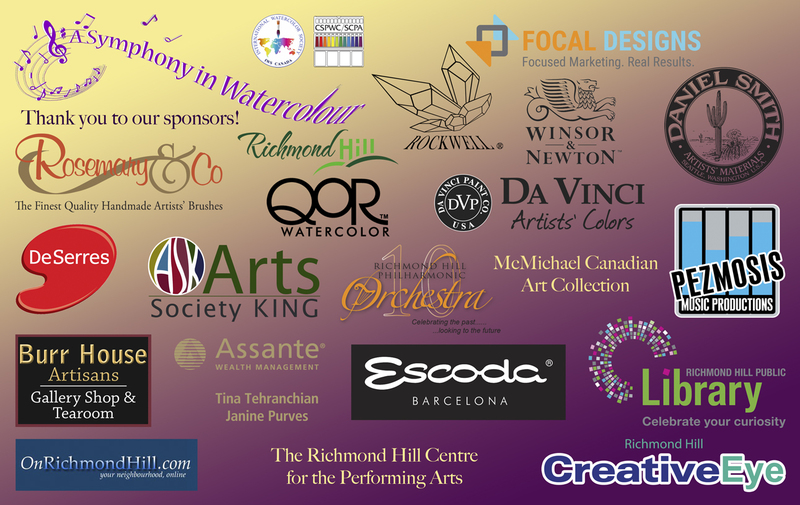 IWS Canada would like to once again sincerely thank our sponsors! I am Dr Madhumeeta Banerjee from India ,whose painting of Banaras Ghats was considered noteworthy.I had planned to come n meet n learn from great masters like Atanur Dogan n others. My husband had renal failure and is on Dialysis three times a week,so had to drop the Canada visit at last minute. My Art -heart and spirit will be wid u during this grand occasion. Hope u all have a great time n share wid us. All the best to organizers for their help and guidance.Maybe will meet up all some other time. We are sorry you couldn’t come and wish you all the best for your husband’s health. Thank you for your entry! There is a link to a map of all the locations on the Home page. And on the exhibit page. Sorry you are having trouble!